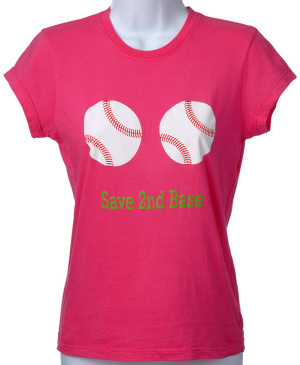 Save 2nd Base is a clever concept for a t-shirt to help raise money to fight breast cancer. It was created by Kelly Rooney, who had a long battle with breast cancer and passed away in 2006. 50% of the profits from shirts sold go to the Kelly Rooney Foundation, an organization established to eradicate breast cancer in young women.